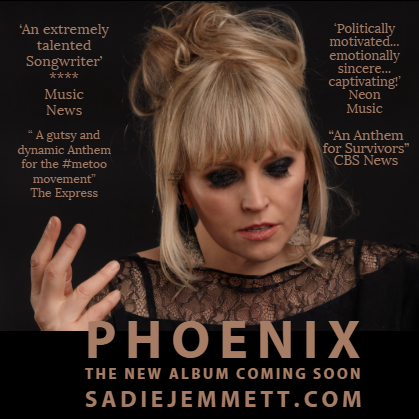 SADIE JEMMETT returns with her new evocative and politically charged album ‘Phoenix’ who’s first Single ‘Don’t Silence Me’ has already made international news and been hailed as the Anthem of the #MeToo era. Don’t Silence Me’ comprises part of Sadie’s forthcoming album ‘Phoenix’ which is set to be released in May. The album highlights Sadie’s versatility as an artist and lyricist and shows a new side to this talented musician. The album traverses subject matter as yet untouched by her delicately and yet the tracks still feature her velvety smooth vocals that we are so familiar with. ‘Rescue Street’ shows her sensitivity as a songwriter, and ‘Bitter’ (with its beautifully gentle guitar riff) is a classic heartbreak track with a tender sentiment. Sadie will be playing live at The Green Note with her band, to celebrate the release of Phoenix, with special guests Danni Nicholls and Miranda Mullholland & Tara Minton opening the night.